Reflashing the firmware is - most likely - not going to solve your issue. Levas, could you build one with 30 and 60 Hz modes please? I got it working, I start the camera in photo mode, OC the SD, switch to video mode where the display is frozen with vertical stripes but it shows a slow preview while recording. The top and bottom of the screen started strobing on any screen even with no SD card but it died away after a while. where the display is frozen with vertical stripes but it shows a slow preview while recording. 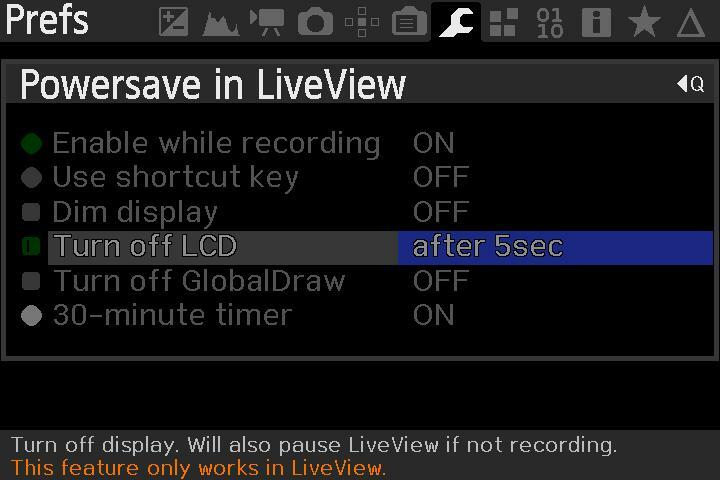 That sounds right, frozen liveview and no preview while not recording, you can get a preview in this state by half pressing the shutter button. The 5x zoom mode should work flawlessly, since 5x zoom always uses the same A and B timer values, no matter what setting PAL/NTSC/24/25/30/50/60FPS. I can make this work in many frame rates and for many basic settings (PAL/NTSC) it's just a matter of adapting some settings in the source. But I'm not sure what you need, are you looking for 2 extra crop presets with 30 and 60 fps setting ? The next time I should make 2 builds, one for NTSC and one for PAL. So for now, with the current build, set your camera to PAL and when using 720p mode, use 720p 50fps. I use 30/60 because computer monitors run at 60Hz and TV's play 30/60 just fine here in England. What about light flickering? It is 50Hz in England. Found a few minutes to alter the crop_rec file to NTSC. 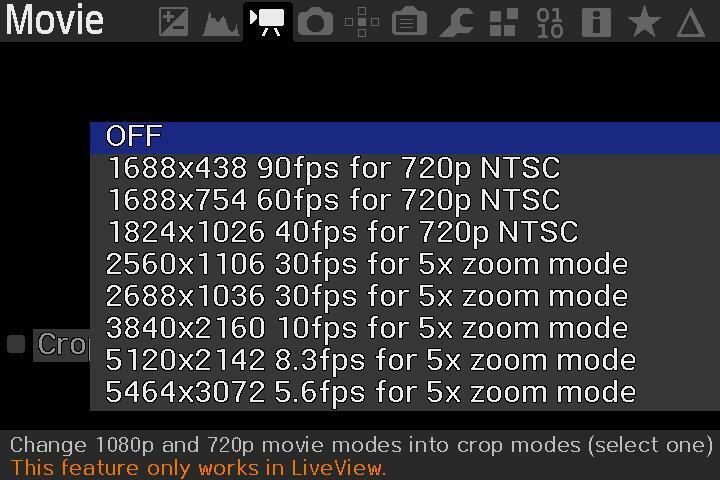 For the first 3 presets, camera must be set in NTSC 720p60fps mode. I keep copies on my downloads page. Look for 6D Canon Firmware for Testers.zip. Thanks dfort, Walter Schulz posted a link to your downloads. Thanks Levas, I consider that my first christmas present. Is this crop_rec module compatible with dual iso mode? Can you provide some links to working files and simple instruction? Is it right that in 6d dual iso looks really good without lost information, because of 1x3 pixel bining? Dual ISO is broken all of a sudden it displays ISOless LV err 3, I even tried removing all of the ML files and redownloading them. Retry in photo and movie mode. If the error occurs you have to restore ML defaults again. More people had the same error on different camera's. There we're some instructions on how to fix this, can't find it back. But you had to search for the address where ISO was changed in camera (done in ADTG override in Debug menu). You have to replace the above file with the the dual_iso.mo file on your SD card. I did more than just reset to defaults I completely removed the magic lantern files from the SD card and re-downloaded them, I've had it working before. Different camera's need different Magic lantern build. 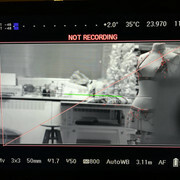 Simple said, Magic Lantern code is basicaly the same, but you need to know specific properties of the camera and all the addresses/locations of the interesting parts in the firmware of the camera. I asked because I know someone who put the 5D ML software on their 6D and it works perfectly fine. Could it be the case that the 5D or 6D software might work on my 6DII? I asked because I know someone who put the 5D ML software on their 6D and it works perfectly fine. Startup process checks cam/firmware version and terminates with a screen message telling it can't run. Some "modules" (=program parts optionally loaded after ML initialization) may be interchangeable. That's all compatibility we have. And there is a ROM dumper able to run on most cams. Just doing that: Dumping ROM contents. Wonder what causes it to change. 1) the cause for this variation is unknown; are these two really the only possible addresses? 3) if outside LV, the error can be probably reproduced in QEMU; if so, that can be used to solve the mystery. 1) Does ML allow for longer than 29:59 videos on my Canon 6D? Does it allow for more than 4GB? 2) Is there a way I can turn off the video preview screen when recording, to eliminate the light source at my kid's play and lengthen battery life? I have it set to a standard focal length and then just leave it on the tripod. I'm using Magic Lantern especially for the raw video capabilities, but I'm assuming your questions are about recording standard movie files with the the mov extension. 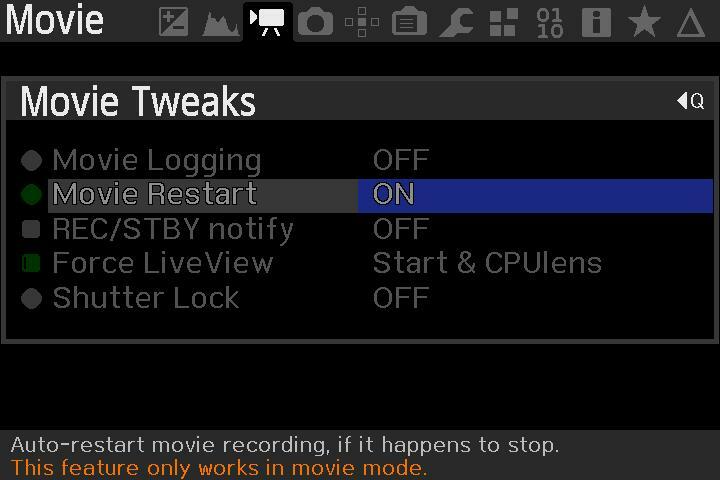 I found an option for turning of the display while recording, seems to work with standard movie recording, did a quick test and display turned of after 5 seconds, and it kept recording. About the 30 minute and 4 GB recording limit I'm not sure about standard movie file recording. But there is an option to autostart recording IF recording happens to stop(4GB or 30 minute limit), so you probably mis a second or something, but it should start recording again when hitting one of these limits. Although, my advise is to test it, to be sure it all works, before trying to use it for something you can't record again. If not using Magic Lantern, there is always the option in Canon menu to DIM the display light to really low brightness. In that case you only have to restart recording manually after 30 minutes. If used on non-exFAT cards recording will break after 4 GiB. 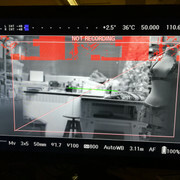 Has anyone else had an issue where in 720p 50/60fps mode, when using focus peaking i get some red lines but no peaking dots when using an external monitor. This works perfectly in 1080p modes and disappears if i disable focus peaking in 720p mode, also works if i disconnect the monitor and use the cameras screen. I've tried a few builds and this has been an issue for all that i've tried with both of my 6D's. if anyone has any ideas i'd be eternally grateful. First of all - Levas, Danne, theBilalFakhouri, dfort, of course a1ex and many others here! - you are all freaking geniuses and I'm in absolute awe of what you have done and keep doing here! Thank you all so much from the bottom of my heart! I discovered ML a couple of years ago after I accidentally bought a 550D (by accidentally I mean I was after a 10-22 EF-S lens, but then found it for sale with the body for less than the lens itself s/h goes on eBay for). At this stage I was 100% Sony guy (used some Canon glass though) and never planned to buy a Canon body ever! So, I ended up installing ML on the 550D and played with it for a while. It impressed the heck out of me and impelled me to get a more capable body with a better sensor. $1100AU later I became a happy owner of a s/h 6D in very good condition. To keep the story short - eventually I ended up just occasionally using the combination of the silent mode with the intervalometer for timelapses because I didn't need all the assisting tools that ML had and the thing that was really revolutionary and sounded like actual magic - RAW video - just couldn't be done in resolutions high enough to be of use for me (and the only body that could do it - 5Dm3- was too expensive at the time). At this stage I decided that since ML had been in development for so long and some very smart people had been working on it, surely they had done everything that could be done or close to it. I couldn't see any dramatic changes on the horizon and so I kind of forgot about it. A month ago I came across an article on DPreview where ML was mentioned and it gave me an impulse to go and check it out again. I'm glad I did. An hour later, after I realized that a revolution had taken place indeed in the form of lossless compression and an SD card hack, with shaking hands I installed Danne's compilation on my 6D, not believing that it would really work, because things like this just can't happen. Then I filmed my first raw footage ever, processed it in Adobe AE and was blown away by what I got. All the advantages of raw photos - extended dynamic range, recovered highlights/shadows, enhanced local/micro contrast, extreme color manipulations - all this was possible now in video! Exacly what I needed and what my filming was lacking. After testing raw video and making sure it was stable, I have been using this at least once a week for filming local bands and producing videos. I have never been so exited about my video editing, because now it's much more satisfying and the result always amazes me. The original excitement still hasn't worn off. I got so excited that I decided to get the best body for ML available now and another $1400AU later (the prices have almost halved in the last 2 years, which is great) I became a happy owner of a s/h 5Dm3 in very good condition with very low sc. Originally I wanted to sell the 6D but now I'm thinking of keeping it as a second cam - guys you are making me crazy! And... just an hour ago I learned that Levas' crop_rec makes it possible to go beyond the stated everywhere 1824x1026 maximum raw resolution of the 6D in 16:9 and I have successfully recorded continuous 2080x1170 at 25fps 14bit lossless (how is this possible Levas? and why isn't this available in experiment builds? because liveview is broken? oh, I think I know - it requires the SD hack and it's considered unstable or something. ), and this is without pushing too hard, I will continue my experiments tomorrow, it's 2am now! LOL, I'm going to go crazy from lack of sleep. It's absolutely incredible that now many older Canon DSLR's - 650D, 700D, 100D - can film raw at resolutions approaching full HD. It is crazy! I will incorporate this new found information into my photography/post processing courses that I do and will educate people about this. Amen @baladev and thanks for sharing your story as it is indeed inspiring with how addicting ML can be while on these aging bodies... just like fine wine as it just keeps on getting better! Lots of improvement over the last years. Magic Lantern is amazing. I remember buying the 6d in 2013, when raw video was sort of just discovered. Not long after that audio recording was introduced and some memory hacks, which doubled almost the recording times. Few years later raw recording in lower bitrates came by, and not long after that...lossless recording, which really changed the game for the SD card Cameras. Thanks for discovering lossless recording Alex !!! I did contribute a lot to finding the possibilities with crop_rec for the 6d. But I only used the tools Alex provided(basic code for crop_rec is done really well, so I could mess a lot with it, without needing to know how the shutter blanking and power save registers work) and had a lot of help from others on the forum like Dfort to learn how to compile Magic Lantern. This ADTG_GUI tool is not for the faint hearted, you see a lot of weird stuff happening to your live view, and the camera often soft bricks...so battery pull is needed. But it's probably the best way to do new findings.